Because of their singular quality of being forever young, Dempsey Essick has chosen dolls to represent three ladies who occupy a special place in his life. Sallie Parnell, Alice DeLapp and Irena McCormick inspired Dempsey's successful reproductions of From Aunt Sallie's Loom, Good Morning Miss DeLapp and Springtime at Irena's. With Special Ladies, he culminates the series with a tribute to the energy and youthful spirit of the three whose combined age is over 289 years. A shaft of early autumn sunlight through Dempsey's studio window highlights a family heirloom rocking chair and brings out the textures in Aunt Sallie's hand loomed rag rug, the color in the pert straw hat on the doll that Santa delivered to Alice DeLapp over seventy years ago, and the intricate stitchery of the cathedral quilt and embroidered doily made by Irena McCormick. 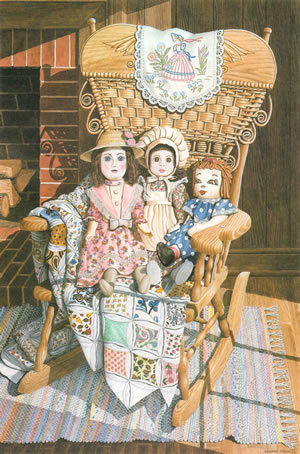 The bright-eyed doll wearing the split bonnet and the red-haired rag doll were supplied by two other Special Ladies - Dempsey's wife, Shelley and daughter, Beth. As in other Dempsey Essick paintings, the viewer can almost feel the weave of the fabrics, stroke the smooth wood of the chair and sense the warmth of the afternoon sun.